All sermon media is available for free, for the spiritual growth of our members and visitors. Watch the latest sermon below, search for past sermons, or watch from our Youtube Page. Below are the most recent sermons. To listen, click the speaker icon of the sermon you'd like to hear. It will open in a new tab with pause and play options. To listen to the mp3 file later, click the download icon. 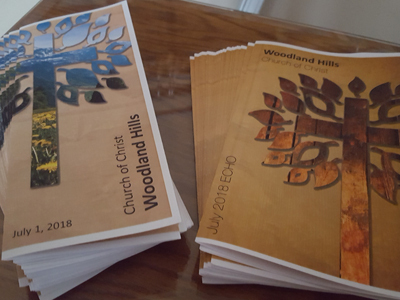 At Woodland Hills, each week a bulletin is handed out before the worship service to greet attendees with the week's schedule, announcements, prayer list, and the service's program. At the beginning of each month an ECHO is handed out at the end of service with a calendar of the upcoming Church events, special announcements, weekly attendance statistics, event recaps, notes from the pastor, a financial report, and more church information. If you'd like a copy of this month's ECHO, please call the church office at 515-265-4667 or download the latest ECHO pdf below.